Purpose: To educate about the uses of battery storage in renewable energy. How have batteries been used in the past to help with an energy crises? What are the benefits of batteries in energy storage? What is the future of energy storage? In late 2017, Hurricane Maria devastated Puerto Rico, taking its electric power grid with it. Tesla stepped forward to provide commercial batteries and solar power as an alternative power solution. Powering small islands is no new feat for Tesla. On the island of Ta’u in American Samoa, they designed a micro-grid that harnessed solar power energy stored in Powerpacks. The energy was converted into enough electricity to power the island for three days. As the world continues to evolve, so does our energy consumption along with it. This on-demand ability to react quickly to energy supply needs is one of the many reasons giant batteries have begun to make a name for itself as the future of power grids. Provides On-Demand Flexibility. Referencing back to Hurricane Maria, the solar power and battery storage combination provides an immediate source of energy that doesn’t rely on the main power grid to operate. From a consumer standpoint, this puts energy production and consumption back in the hands of the homeowner. Optimizes Energy Supply and Demand. 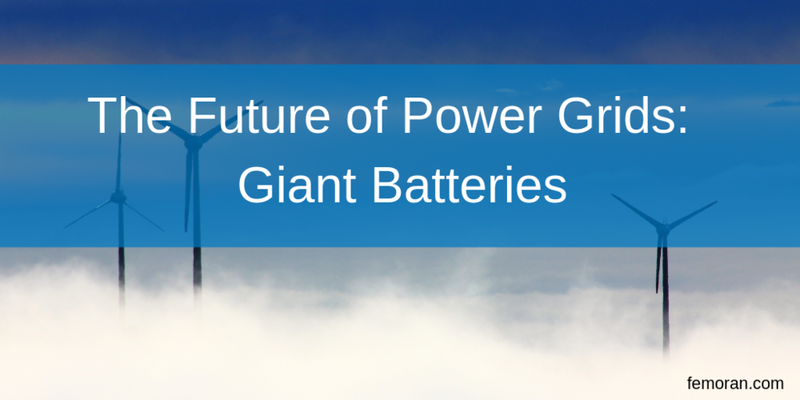 Batteries enable power plants to maximize peak energy production and peak demand. Energy can be collected at optimal production times and released as needed. The ability to generate a consistent supply can lead to lower costs for the consumer. Energy storage facilities are a new concept for many. As a result, most units weren’t designed for battery storage specifically. This can present a fire hazard due to poor ventilation coupled with hydrogen emission from the batteries. A fire protection system should be installed. To avoid electric shock, do not use a water suppression system. It’s recommended for firefighters to use a carbon dioxide extinguishing system. With the proper processes put in place, battery storage facilities can run smoothly and safely. The energy storage market is thriving and doesn’t appear to be slowing down any time soon. Fossil fuels have commanded 60-70% of the market consistently since the 1970’s. Renewable energy and batteries are projected to capture two-thirds of the market by 2050. The market grew 46 percent from 2016 to 2017. This shift can be majorly attributed to the rapidly declining costs in batteries and renewable energy sources. Cheaper battery storage options are building a compelling case for a profitable transition towards solar power grids. The BNEF anticipates battery costs to reach $70/kWh by 2030, a 67% drop from today’s prices. “We see $548 billion being invested in battery capacity by 2050, two-thirds of that at the grid level and one third installed behind-the-meter by households and businesses,” predicts Seb Henbest, with Bloomberg New Energy Finance. Industry leaders such as Tesla and GE continue to invest heavily in research and development, and their advancements are turning heads. Recently, Mercedes-Benz converted a coal-fired power plant into an energy storage facility by using electric car battery packs. This is fresh off the heels of Germany’s first-ever battery storage plant with ENTERTRAG this year. The energy storage trend shows that consumers are beginning to think strategically about energy production. Commercial and residential users alike are expanding into new and exciting territory. Renewable energy will continue to push the envelope as the market continues to advance in battery technology. Newer PostFire Panels: What is your trying to tell you?